When you open a file, you will see a new comment option in the file viewer. Clicking this option will open the comment sidebar where anyone you share a file with can leave a comment. When someone leaves a comment on your file, you will get both a desktop and an email notification ensuring you don’t miss important feedback on your work. The comments are real-time which means your whole team can participate in the discussion, much like a private chat room built into the file viewer. The comments update automatically and you can @mention people to notify them directly. You will find a comment button in the header with a counter that tells you how many comments have been left on the current file. You can click this button to show/hide the comment sidebar. 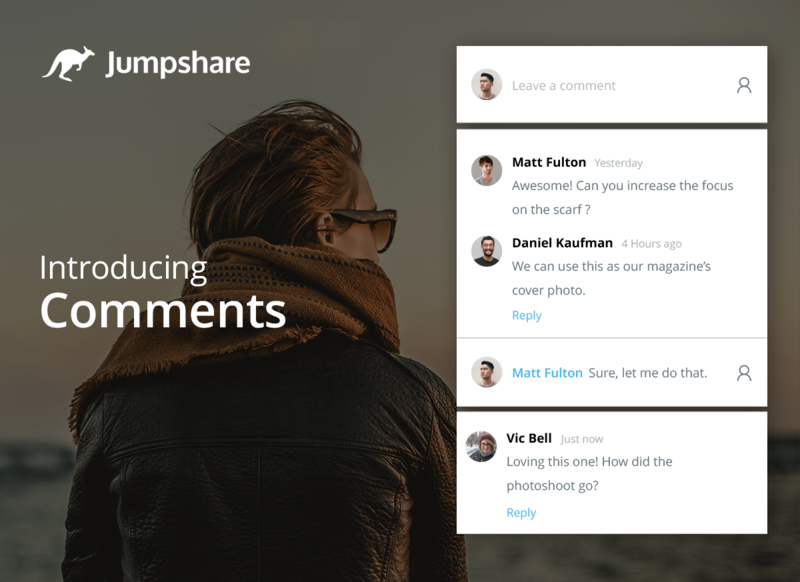 If you don’t want people leaving comments on your files and want the same old sharing experience, you can disable comments from the Jumpshare Settings page. Comments are available on Web, Mac and Windows apps, and coming soon to our iPhone app.